The view at the end of March is distinctly yellow ! It is the predominant colour and leaps out to smack you in the eye from daffodils, forsythia, kerria, japonica and cowslips. Now, although not a fan of yellow flowers generally, I can make an exception for all these heralds of Spring as they are so very welcome at the end of a dreary winter. The pond is full of frogspawn, and the frogs are still having a froggy - riot in there, a non stop party to which all are invited. The first clump of spawn appeared overnight on 12th March, to be followed by dozens more over the next few days. The marginal plants have been triggered into growth already and Caltha Palustris (Marsh Marigold) is in full flower. Although Spring is extremely welcome, I always feel a brief wave of despair when I look at the garden, as although lots of things are growing, there are still huge stretches of bare earth. I can never fully visualise how the garden will develop that exuberant abundance later in the season. The lush growth and flowers of summer are hard to imagine at this time of year. This is when blogging comes into its own, as I, like all garden bloggers, have a million squillion photos of the garden throughout the seasons, so it is easy to remind myself how the garden burgeons over the next few weeks. Looking at photos can be so useful, as they are hard evidence that things will improve! 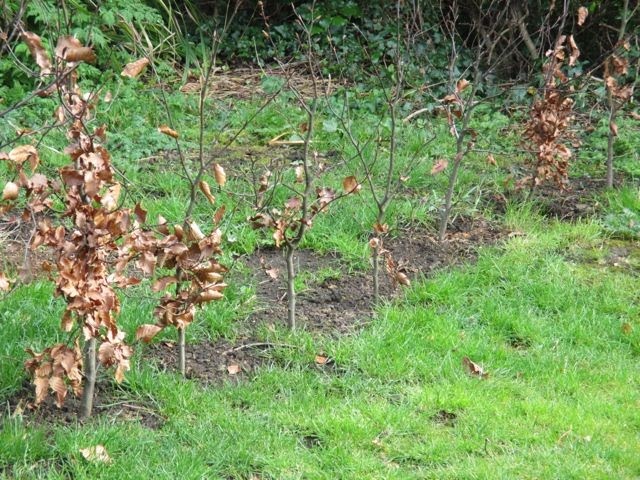 A couple of weeks ago, we planted 50 new bare root beech hedging plants, to enclose the north and east side of the veg plot. Because of the mild winter we had to get them planted as quickly as possible after they arrived, as the leaf buds were very well developed, and the plants were coming out of dormancy. 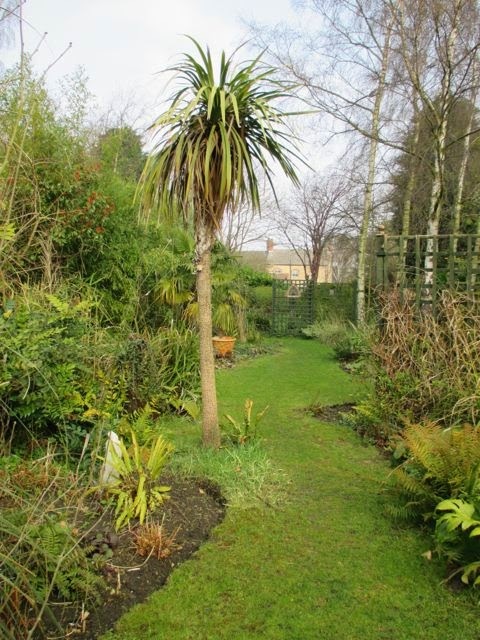 The sub- tropical garden hasn't had the battering is usually gets every winter, and hopefully there has been no check to growth, as the palms and more tender plants have had no need to recover from very low temperatures. The geraniums are well into growth, and I do like them at this time of year, as they are like Yorkshire puddings on a tray - all neat and round and uniform. I know they are just biding their time before they begin their annual sprawl! All the roses are now in strong growth, including the dozen or so bare root plants which are just beginning to establish. In the photo above is a hedge of 'Charles de Mills' , underplanted with Rosa 'Garden Party'. 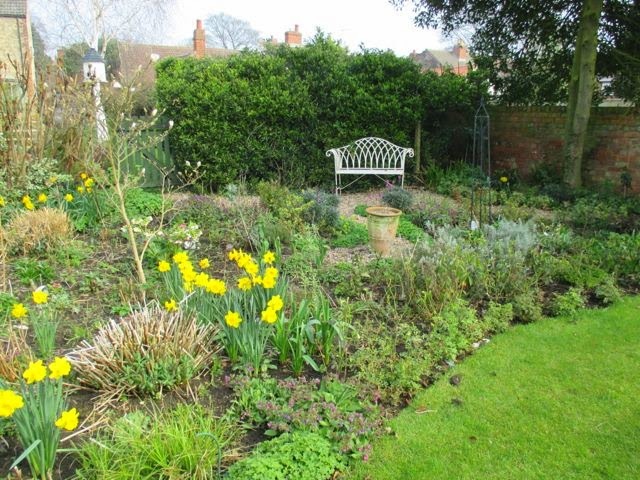 All have remained in leaf throughout the winter, giving welcome structure to the garden. All the Euphorbias are looking splendid at the moment, fresh and colourful, dense and compact. They are a lovely dark contrast to the pastel colours of the flowers. 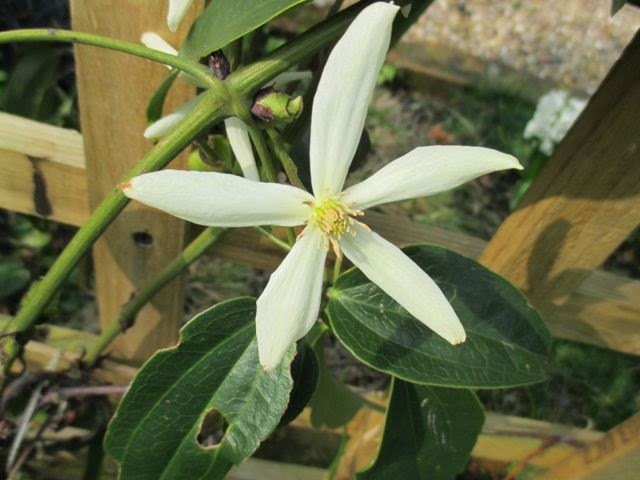 This is Clematis Armandii, flowering for the first time, and is is another plant which breathes a sigh of relief when the winter passes without a spell or two of really cold weather. It is a tender plant which really benefits from some winter protection, but it is well worth the effort. The flowers are large and gorgeous, and I thought they were scented, but this one certainly isn't. 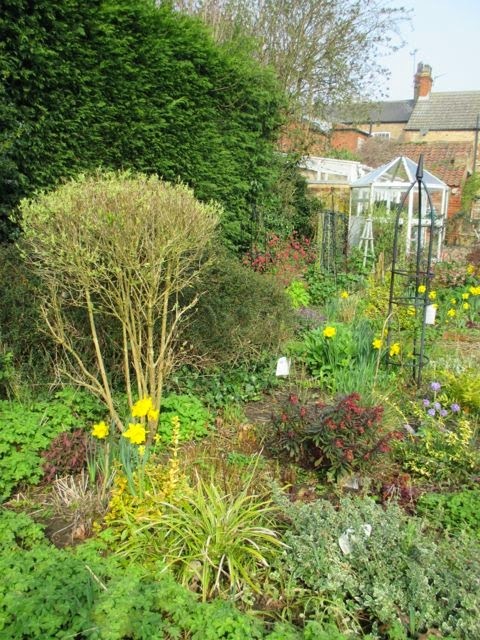 The borders are springing into growth, perennials are pushing through, shrubs are beginning to leaf up and bulbs are flowering. 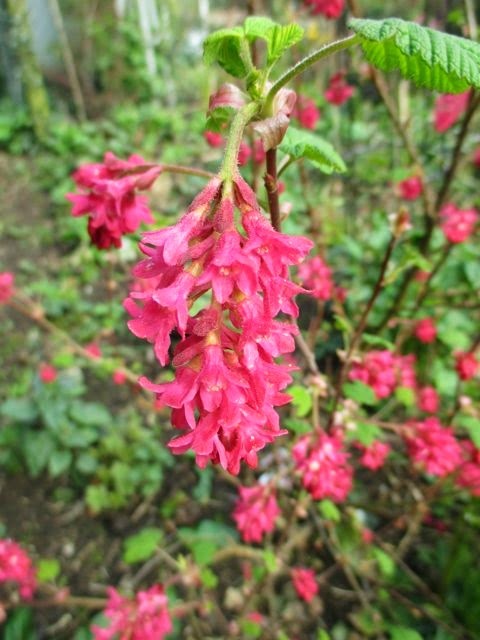 Some shrubs are flowering, mainly forsythia, Kerria, Magnolia Stellata and Flowering Currant (Ribes). Primula Denticulata (above) the Drumstick Primula, sits well with some naturalised hyacinths (below), which were originally grown in the house, as forced bulbs. 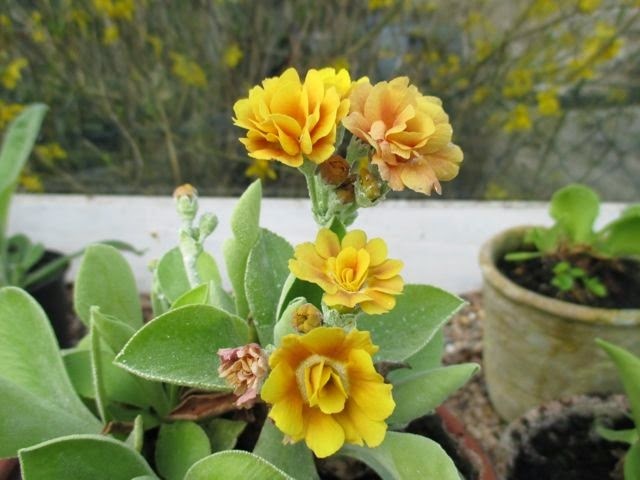 There is good news in the greenhouse as the Auriculas have started to bloom, so I have moved them outside onto the old stepladders, which desperately attempt to morph into an Auricula Theatre. The first one to flower was a large double, in an unusual delicate orangey - yellow, and it was followed soon after by a tiny single, dark red . I am very cross with myself as I have lost the labels for both, so if anyone out there knows the name of these little beauties, please would you let me know! The 'EOMV' has been a real pleasure to put together this month, as I have had a wealth of subjects to choose from to photograph ! Throughout winter, it is usually a case of 'Hunt the bloom', and there is no selection process. If it's in flower, it gets photographed. This month, for the first time in this new season, I have had a profusion of subjects, which means that Spring has most definitely sprung! You can see many other 'End of the month views' at 'The Patient gardener', hosted by Helen Johnstone. There is a big diversity of gardens from around the globe, and some excellent blogs to hop across to. Wonderful spring photos and so amazing colors ! Thanks Ela. It is nice to have subjects to photograph ! 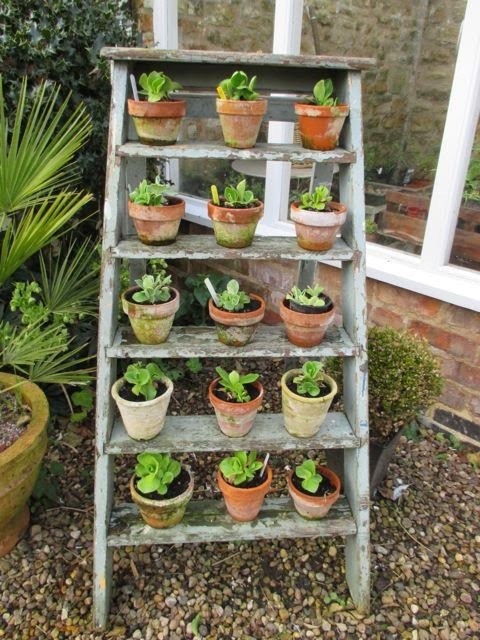 Be confident - the step ladder works wonderfully for the auriculas. Hi Gwenfar, thanks for that ! It is a lovely time of the year when the Auriculas come into bloom. Hi Jane, I can imagine that it was fun for you to put this post together. Your garden is a spring dream!!! I love all the daffodils peeping out of your flower beds and give them just that cheerful pop of color. My favorite plant has to be the primula denticulata and your auriculars are quite lovely. I am surprised that they keep standing on the step ladder and are not blown over by the wind. Looking already forward to your next EOMV! Have a nice week! Hi Christina, thanks for your kind comments. 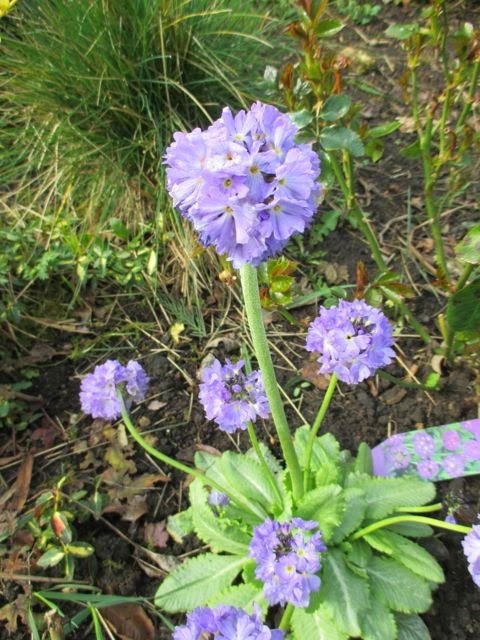 Primula Denticulata is a lovely plant and I just hope I likes conditions here, as it is newly planted. Hi Endah, you are too kind! Thanks for your comments! You are so right about blogging and all those photos which remind us how our gardens will look during the coming months. Your garden is wonderful - and I am so pleased you got that lovely hedge planted in time. Hi Sarah, it is funny how blogging has so many additional benefits ! Things that I never thought about when I started ... like improving my geography !! So much colour and your garden is coming along very nicely! And great to see such a tall trunked cordyline, a sight I so miss ever since a majority of specimens have been cut back down to the ground as an aftermath of winter 2010-11. 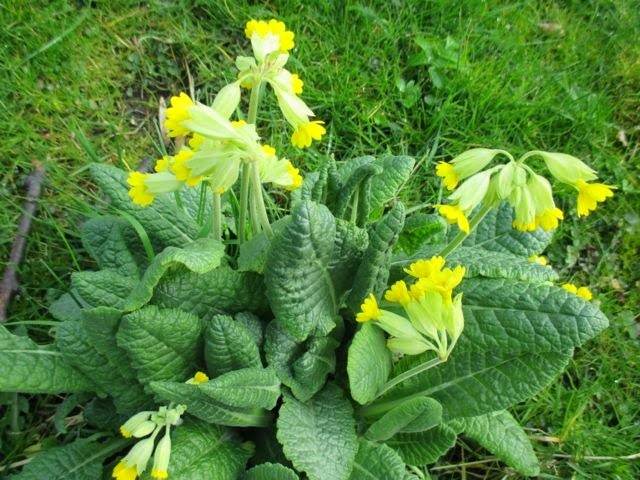 And what about my favourite native primrose? It really does look as if your garden hasn't gone to sleep this winter. I love the injection of yellows around the place, it kind of holds every thing together. It won't be long until spring is gone from our memories for another year, it's nice to enjoy it while we can. Great post and some gorgeous blooms Jane. Hi Angie, belated thanks for comments (have been on my hols ! ), Spring is so fleeting , you are right, we are moving already towards summer! We hear the frogs at dusk at a nearby pond. They are such a reminder that spring is here. 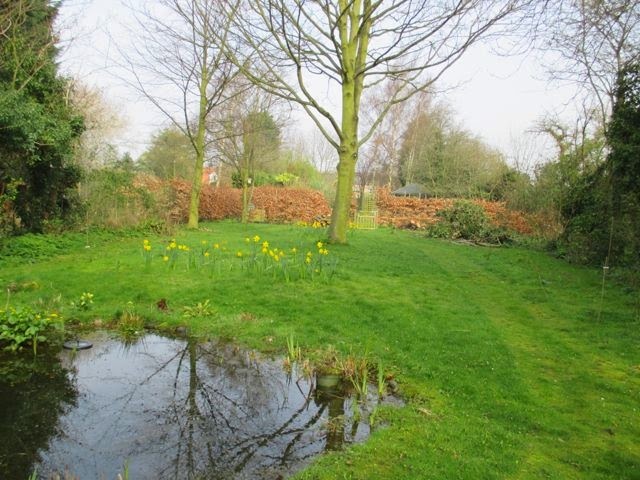 Your pond looks as if it will burst forth with more life any moment. 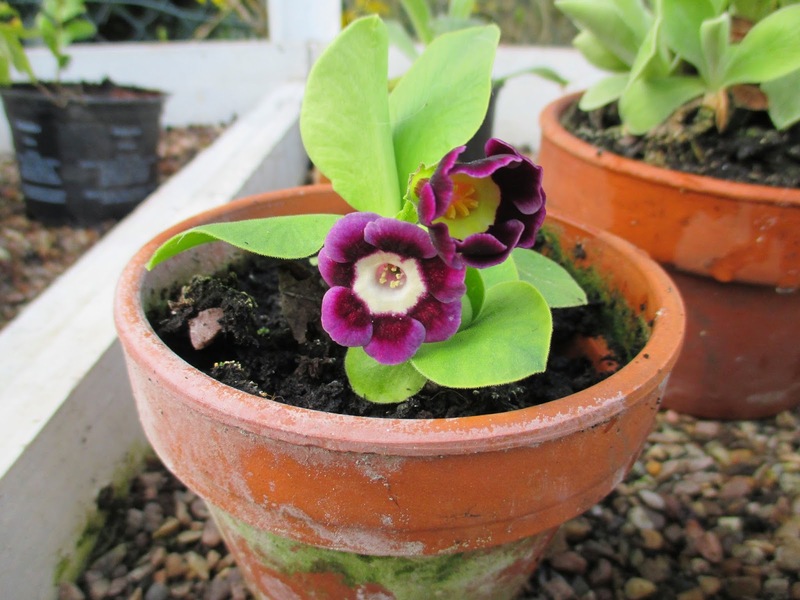 The Auricula theater is a beautiful way to display them. Hi Sage Butterfly, and thanks for comments. 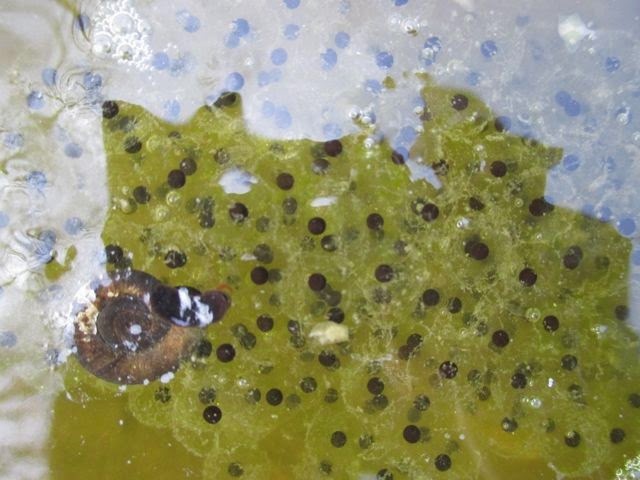 Have you got tadpoles now, after all the croaking ? The sides of our ponds are black with them, there are hundreds this year, compared to last year when the late frosts killed many of them off. Hi Helen, thanks for comments. Yellow is already giving way to a palette of pastels (19th April). Some lovely spring colour in your garden.. You are so lucky to have frogspawn.. we haven't had frogs in our pond for a number of years and I do miss them. Hi Julie. You must miss the frogs in your pond. Ours just appeared , I think they had hopped over from neighbouring garden ponds. Hope you get some intrepid wandered back in yours ! This is the fist I have heard of your party and I will be sure to be back next month. Thanks for hosting. 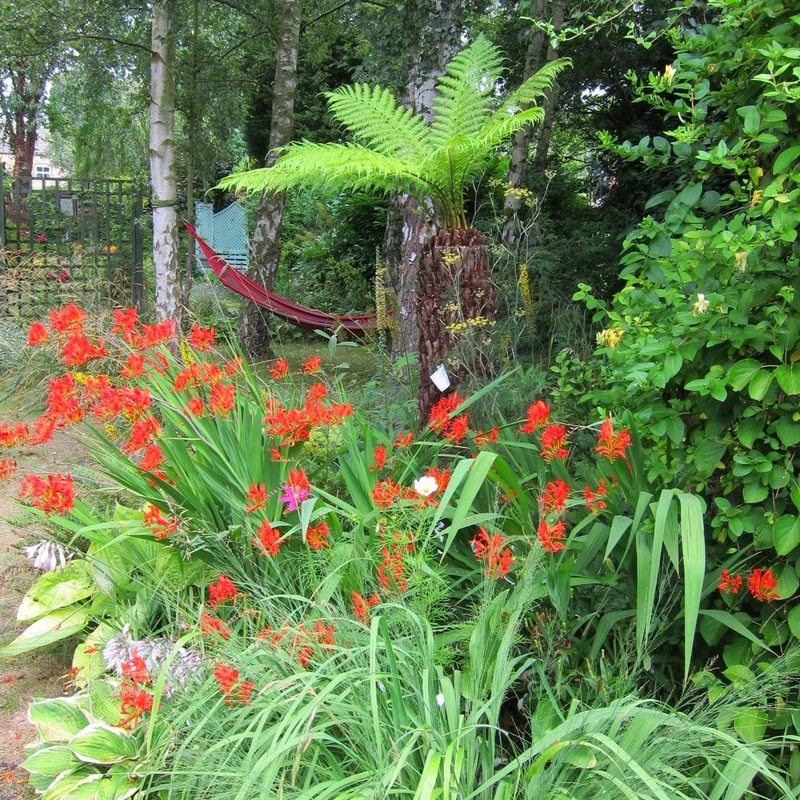 Hi Derek, EOMV is a good party to come to, as there are very diverse blogs/ gardens taking part. I hope your snow is long gone now and signs of spring are all around ! It's a riot of colour and looks fantastic. 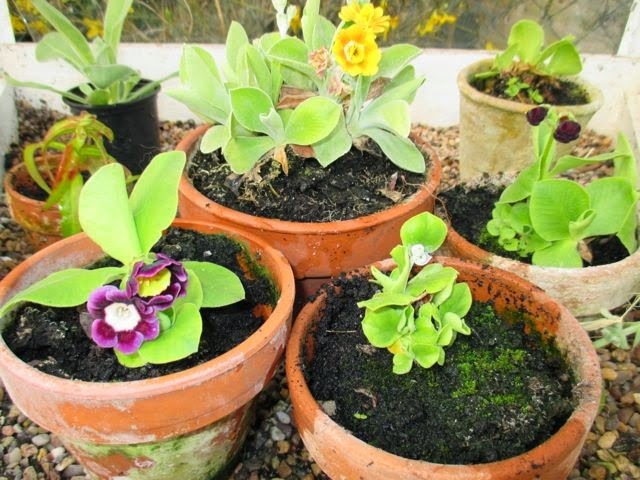 The auricula theatre is inspired! Having photographs from last year has really helped me out as I've been renovating my terraced beds this year. I've been able to look back and see exactly how tall something grows and what shade of colour it is. So much better than relying on memory. Hi Rusty Duck and thanks for comments. 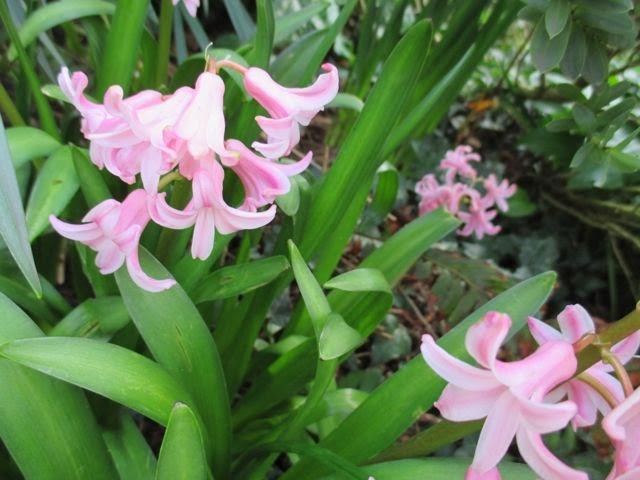 All these photos really do have their uses - I am planning to use them to help me with bulb planting in the Autumn, as I can never remember what I have planted where ! 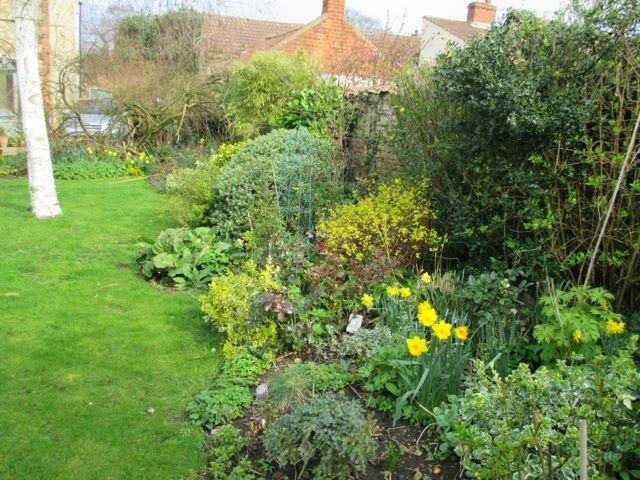 I love all the bright yellows in your garden; I do love the combination of yellow spring flowers with the new, fresh greenery around them. I have some cowslips in flower here,too, they are a spring favourite of mine. I do envy you the frogspawn. There's still no sign of any frogs near my new pond! I adore those primroses and they are a big part of my fantasy English garden, which exists only in my own mind. Do they go dormant in the summer in England? In North Carolina, they go dorman at the first sign of heat and usually don't bother to come back. Yet the nurseries insist on carrying them and calling them perennials. Hah!! I am so envious of your drumstick primulas! I tried some here in Ohio but the plants died of too much rain early in the spring/summer. Is this a primula that likes dry soils? I can grow Japanese primulas and some Primula vulgaris but that is all so far. Lovely garden! Can't wait for your April up-date. 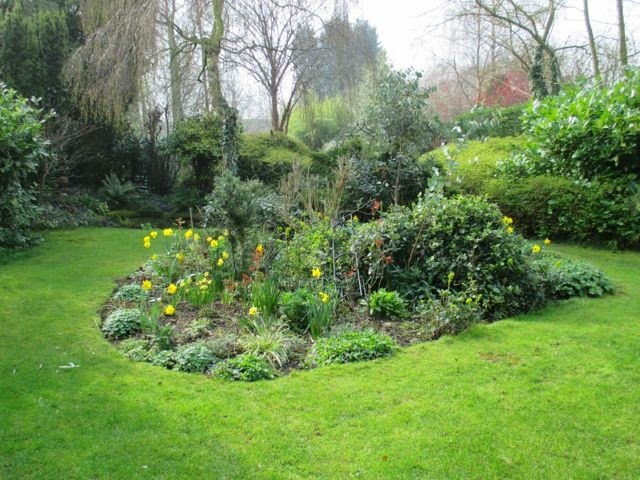 I am so enjoying visiting some spring gardens on the internet. Here there is still precious little in the way of green, let alone flower. I love the Auriculas. I only ever once attempted to grow them and the experiment failed. Auriculas always make me think of old master's paintings. They are just beautiful! I loved your comment about geraniums, I was looking at the neat domes in pots of some of the ones I brought with me earlier today, and had to remind myself that they rapidly turn in to complete thugs, and in this particular case, don't flower for long either! But they are from the very first plant I was ever given when I got my first ever garden, so they are going in somewhere. As for kerria and forsythia, I wish I had room to enjoy them and then not mind that they then become rather boring! Flowering currents, on the other hand, appear to really thrive around here, I may have to give one a go. What kind is yours, I love the vivid colour.